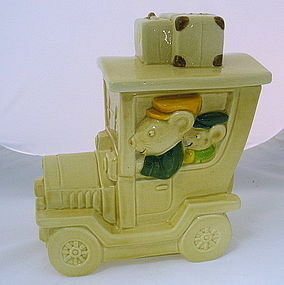 Metlox Mouse Mobile Cookie jar featuring a father mouse and his son on the driver's side. On the passenger side is mother mouse in a yellow bonnet with two little mice (a girl and a boy) peering out the window. The back of car has little boy mouse in a yellow shirt peaking its head out. The license plates on the front and back read ENJOY. More photos available upon request. In excellent flawless condition it measures 11" high with the suit cases on the top. Used : In Great Condition, no chips or cracks, inside the lid is has a very fine hairline fracture. This cookie jar has been sitting on a shelf in a vintage store. Size: Height: 11 " with the suit cases on the top, Base: 8 1/2" X 4 1/2"